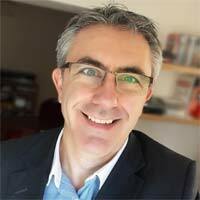 Haydon Rouse Consultancy Ltd is run by Haydon Rouse, a digital marketing specialist, with over 20 years experience of promoting products and services online. It is my mission to help you succeed. If you succeed, then I succeed. Sounds a bit cliche doesn’t it? But I really do get a buzz out of helping people! Hence why I will do my utmost to give you excellent service. I want to help you achieve your goal, be it to sell your house for the best price, to rent out your offices or promote and sell your products online. I provide a service that gives customers results. I have been selling products and services online for over 20 years. As well as my marketing skills and technical knowledge of the internet, during my career I have gained extensive training, project management and bid writing experience. I have lectured thousands of students, spoken at various conferences and on radio about a variety of web design and internet related topics. For further information on Haydon’s history, career and experience, please scroll down and read the section on Career History. 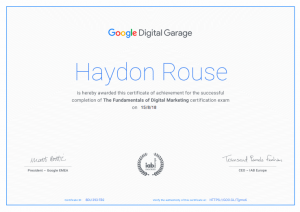 I have passed The Fundamentals of Digital Marketing certification exam by Google. This is an online learning plan of 26 digital marketing topics with a final exam at the end. In today's digital world, where just about everything is sold and advertised online, it is vital to understand and be able to take advantage of the myriad of online tools. I can help you do just that. Read what others say. I strive to offer the best solution for you, your business and offer impartial advice at an honest price. I am constantly researching new technologies, learning new marketing methods and updating my knowledge. I love what I do and bring enthusiasm and commitment to every project I work on. Put simply, I want to become your partner and work together with you for mutual benefit... I actually enjoy helping people! With access to a trusted network of business professionals Haydon Rouse Consultancy Ltd is able to serve clients of all sizes. I have a degree in Business Management. I have an extensive knowledge of online marketing including search engine optimisation, social media marketing, Pay Per Click, affiliate marketing, viral marketing, analytics, link building, copy creation, business management, project management and bid writing. I have created and maintained a range of web sites from basic to those using content management and shopping cart software. Installation and and customisation of Content Management Systems (CMS) such as WordPress and Joomla to make them seo friendly. Installation of components, modules and add-ons. FTP, web hosting, Apache server management. Good understanding of Windows operating systems. I have lived in East Kent all my life, and consequently know the area very well. 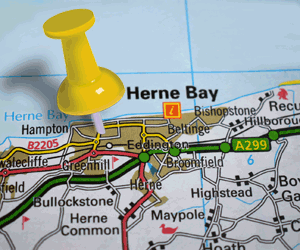 I grew up in Whitstable, lived in a pub in Sandwich for a bit, then moved back to the Whitstable and Herne Bay area. On leaving school I went to the local technical college and took a BTEC National Diploma in Business and Finance. Whilst at college I worked part time for a jewellers. It was my first proper job and I learnt a lot about customer service and sales. After passing my college course I got a job at an insurance brokers as a trainee commercial account handler. Looking back I received some great training. After a few years I wanted to move up the corporate ladder and if you want to progress in insurance then you have to work in London at a Lloyds brokers. I therefore got a new job in London working for Alexander & Alexander, who then got taken over by Aon Risk Services. The same company that bought my previous employer! I was a Senior Broker at Aon Risk Services (the then largest insurance brokers in the world). As Senior Broker/Team Leader, my team and I negotiated and arranged the commercial insurances for various “Blue Chip” companies. I had some really big clients. Prestigious companies for whom I negotiated hundred thousand premiums. I enjoyed working in the City but commuting to and from Kent was a pain. It was 1996/1997, I was getting up at stupid o’clock and not getting home till late. The IRA had been detonating bombs in London and after a few more years in insurance I felt it was time for a career change. Around this time, I did a stint (6 years) in Kent Police as a Special Constable and became a Section Leader, taking responsibility for a small section of officers and their training. 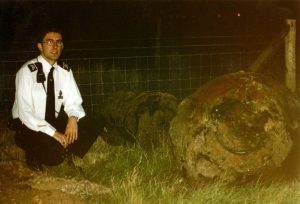 Me guarding recovered bouncing bombs nr Reculver, Herne Bay in 1997. I really wanted to work with computers and it was around this time that I started to teach myself web design. I then got a job at PC World, Canterbury as Business Centre Manager. Here I was able to update my computer skills and IT knowledge. but I really wanted to work for myself so I set up my own web design business. I left PC World and created Saxons Design (later to change name to Saxon Internet Solutions), a web design and internet marketing agency in 2000. In 2002 I started lecturing part time as a way of getting new web design clients. This worked well and I found many students either wanted to me to continue teaching them or build a complete site for them. I worked as Project Development Executive at Canterbury College, one of the largest Further Education Colleges in Kent. My role involved me initiating and setting up new income generating projects and sourcing and bidding for grants and Government contracts, often in the welfare to work sector. Supports Whitstable Town FC and Tottenham. Outside of work I enjoy playing 5-a-side football, badminton and spending time with my family. The comments expressed on this blog are the views of Haydon Rouse only and do not represent the views of any employer or contractor.